Remember this rabbi above? We used a picture of in the blog entry, the true face of Talmudism shows itself. Well, the rabbi pictured giving the devil horns is none other than Rabbi Yitzchak Ginsburgh an American born chabad rabbi currently living in Israel. In another entry, six hands kissed for six million!, we discussed the significance of Francis kissing the hands of six people at Yad Vashem. The excerpt below is from Rabbi Yitzchak Ginsburgh's book on the mystical dimensions of the Hebrew alphabet, "The Alef Beit." We provide this for our readers in case they know anyone who still thinks modern day Judaism has anthing to do with the Old Testament and to demonstrate these modern day Talmudists are the spiritual heirs of the people Christ referred to as following the man made "traditions of the elders." So read on and learn all about the magic & mystical powers of the number six. Thanks to Paul VI a reader of Call Me Jorge... for sending us this information. The underlines are ours for emphasis. In the beginning of Creation, when Infinite Light filled all reality, G d contracted His Light to create hollow empty space, as it were, the "place" necessary for the existence of finite worlds. Into this vacuum G-d drew down, figuratively speaking, a single line of light, from the Infinite Source. This ray of light is the secret of the letter vav. Though the line is singular in appearance, it nonetheless possesses two dimensions, an external as well as an internal force, both of which take part in the process of Creation and the continuous interaction between the creative power and created reality. In Biblical Hebrew, the letter vav also possesses the function of inverting the apparent tense of a verb to its opposite from past to future or from future to past (vav hahipuch). The first appearance of this type of vav in the Torah is the letter vav" which begins the twenty-second word of the account of Creation, "And G-d said...." This is the first explicit saying of the ten sayings of Creation: "And G d said [the verb 'said' being inverted from the future to the past tense by the vav at the beginning of the word--'And']: 'Let there be light,' and there was light." The phenomenon of light breaking through the darkness of the tzimtzum, the primordial contraction, is itself the secret of time (future becoming past) which permeates space. In the Divine service of a Jew, the power to draw from the future into the past is the secret of teshuvah ("repentance" and "returning to G-d") from love. Through teshuvah from fear, one's deliberate transgressions become like errors; the severity of one's past transgressions becomes partially sweetened, but not completely changed. However, when a Jew returns in love, his deliberate transgressions become like actual merits, for the very consciousness of distance from G-d resulting from one's transgressions becomes the motivating force to return to G-d with passion even greater than that of one who had never sinned. Every Jew has a portion in the World to Come, as is said: "And all your nation are 'tzadikim'; forever they will inherit the land." The power of teshuvah to completely convert one's past to good, is the power of the vav to invert the past to the future. This transformation itself requires, paradoxically, the drawing down of light from the future to the past. Drawing the future into the past in the Divine service of man is the secret of learning the inner teachings of the Torah, that aspect of the Torah which is related to the revelation of the coming of the Mashiach. Rashi explains the verse in the Song of Songs: "May he kiss me with the kisses of his mouth, for your love is better than wine" as alluding to the sweet teachings that will be revealed by the Mashiach. When a person intently studies the secrets of the Torah, he draws from the future into the past, in order to strengthen himself to return in complete teshuvah from love and thereby convert his past into future. Twelve pillars of Creation - the twelve lines of a cube. The twelve tribes. Seven pillars of Creation - six directions and time. The seven shepherds. One pillar of Creation the future Mashiach. The connecting rods in the Tabernacle. Complete stature of man - standing on earth with head reaching up towards heaven. The Jewish People standing together. The "Golden Path" in the service of G-d. The torso in relation to the hands, feet, and brit. Consistency of the middle pillar. Divinity piercing through the middle point of every Creation. The connecting hooks of the pillars in the Tabernacle - concealment and revelation. The axis of symmetry and the equilibrium between symmetry and asymmetry. The power which links together the souls of Israel. The points of will to do G-d's Will engraved in the heart of every Jew. The axis which connects the good points present within every Jew. The connecting link between the separate Laws - engraved letters of Divine essence - of the Torah. The force of connection between the Divine sparks inherent throughout reality. Six Days of Creation, and their six corresponding Divine forces active in creation. Six letters of the word bereishit, "In the beginning." Six alefs in the first verse of the Torah. Six-millennium duration of the world. Six directions of the physical world. Six wings (states of love and fear in the soul) of the fiery angels. Six orders of the Mishnah. The six "wings" of the "Magen David." Tablets received by Moses at Mt. Sinai. Did you catch all that dear reader? The letter vav has many meanings to Talmudists besides representing the number six. It connects the the internal with the external, the creative power with created reality. 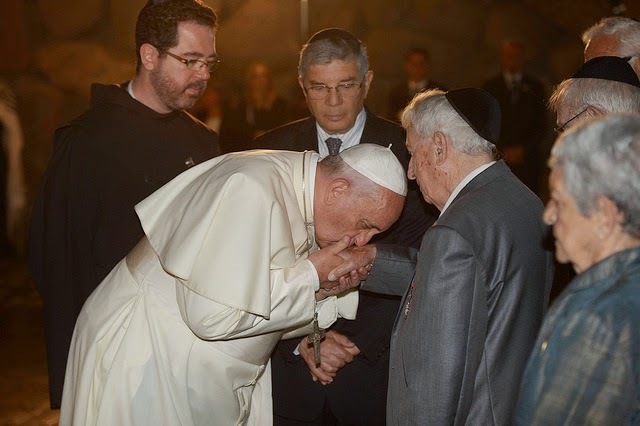 What reality was being created by Francis appearing at Yad Vashem and kissing six hands? Not only that but the rabbi teaches vav or the number six can mystically draw from the future to influence the past! What a deluded mind Rabbi Ginsburgh has! Is the future they hope for a Novus Ordo church subjected to the Noahide Laws? Our favorite is this dandy, when a Jew sins if eventually he returns to G-d, his sins now become merits! So don't worry about the well being of your fellow man, you can abuse and abandon him, it is all good so long as you return to G-d. Dear reader have you seen this played out before? Another gem is when one studies the Torah, what we would properly call the Talmud, one can convert the past into the future. Lastly, the vav or number six represents all the souls of Israel or the Jewish people standing together which are the divine essense, the spark of light, the foretold messiah as they look skywards towards heaven. One more we forgot is the vav or number six represents concealment and revelation. This is what author Michael A. Hoffman has referred to in his writings as the Revelation of the Method. In the end days, the cryptocracy in order to process the minds of the enslaved even more deeply, will reveal the methods they used to get their victims to subject themselves to voluntary slavery. Francis is many things but he is no idiot. He knows all the minutiae concerning the modern day religion of Judaism. It has come out in interviews he looks to the rabbis on how to interpret the Bible & the teachings of Christ and keeps several rabbinical tomes in his 'apartment' which he regularly consults. We would bet Francis knows all the above and more. So his act of going to Yad Vashem where he kissed six hands was an act of mystical rabbinical magic in which he spiritually submitted to the supremacy of talmudic rabbinical Jewish religion. At least, this was the sign the deluded minds of the rabbinical practitioners of Jewish magic saw Francis giving at Yad Vashem. All this leads us to another question we here at Call Me Jorge... will , God willing, one day answer. Why is Francis kowtowing to these insane individuals? "when a Jew returns [ to G-d] in love, his deliberate transgressions become like actual merits, for the very consciousness of distance from G-d resulting from one's transgressions becomes the motivating force to return to G-d with passion even greater than that of one who had never sinned." Mary: This is what I want... I would also like to be a sinner, a big sinner, if I were not afraid of offending the Lord... Tell Me, mummy, can one be a sinner out of love of God? Mary's Mother Anna: But what are You saying, my dear? I don't understand You. Mary: I mean: to commit a sin in order to be loved by God, Who becomes the Saviour. Who is lost, is saved. Isn't that so? I would like to be saved by the Saviour to receive His loving look. That is why I would like to sin, but not to commit a sin that would disgust Him. How can He save Me if I do not get lost? Not a problem Maurice. Thanks for your insight. We only have a familiarity with The Poem of the Man God from excerpts on your blog & from the website Tradition In Action. How far and deep talmudic thought has seeped into the formerly Christian culture never ceases to horrify us. This is why Conspiracy theorist Freeman Fly says the energy drink Monster is 666 because it has three Vavs on the cover of the cans as the "logo" of the drink. So people literally are drinking the "number of the beast" - consuming it literally, so to speak, when they drink that. Some of the other energy drinks have similar type names from what I hear - demonic names. This is what these people prefer to our Lord and Saviour Jesus Christ. One can see why the Church always said the number of the elect would be small, and why our Lord said that if He didn't shorten these times even the elect would not make it. I wonder if their obsession with the number 6 has any bearing on the Revelation ,the number of the Beast is 666,and no one will be able to buy or sell unless they subject themselves to the service of the Beast. sodomite Elton John is a fan of Francis! Throwing the moneychangers out of the church?